Search.searchfdf.com is the PUP that uses misleading techniques to prevent removal. Use Reimage to locate malicious components and get rid of them faster than with uninstall instructions. A full system scan blocks virus reappearance and prevents traffic to malicious domains. Search.searchfdf.com virus. How does it act? How did this hijacked manage to find a path into your computer system? What is the right way to remove Search.searchfdf.com? If you are looking for a good web search engine, then you for sure should skip the Search.searchfdf.com option. This website is reportedly related to Search.searchfdf.com browser hijacker (powered by Safer Browser), which is a potentially unwanted program (PUP). This PUP can cause various inconveniences, starting with system slowdowns, browser redirect issues, the appearance of countless pop-up advertisements and other problems. 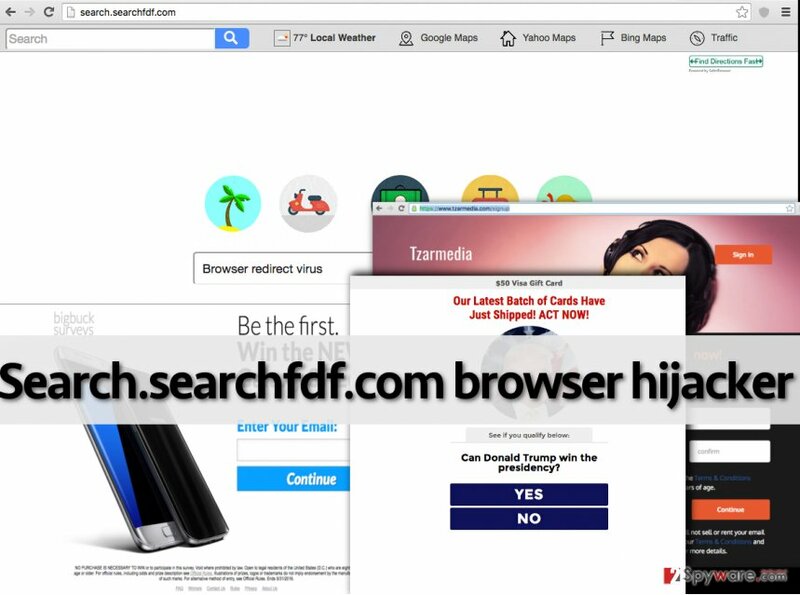 If you have already experienced any of the listed issues, then we suggest reading all information till the end of the page, as we are going to provide essential information about this browser hijacker, how did it hijack your PC, and what can you do to remove it. This browser hijacker aims to turns each of user’s browsing sessions into a pay-per-click profit generation for the developers of this dubious PUP. When the computer gets infected with this hijacker, every web browser becomes affected and then homepage and default search settings are being modified. Obviously, there is no need to discuss what page this hijacker seeks to promote. If you have already been affected, you can see that this vague website suggests using a questionable search engine, which looks safe at the first glance, but actually, delivers very strange search results. If you have already tried searching via this search engine, you should have noticed that instead of opening corresponding web pages, it launches shady third-party sites. Annoyance that such redirects cause is not the only bad thing about them; an even worse thing is that these redirects can open highly insecure Internet pages, where you can be misleadingly convinced to install some pieces of software or bogus updates. 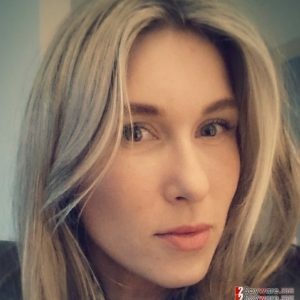 You should be aware of scammers that try to convince naive PC users to install various dangerous applications via safe-looking sites. Be very careful, and try to control your curiosity; otherwise, you might end up installing harmful software on your PC. All in all, you should think about using a safer search engine, such as Google or Yahoo. To remove Search.searchfdf.com, employ Reimage or a similar anti-malware software. Remember – you are in full control of what programs will be installed on your computer. Only in rare cases, cyber criminals manage to cause damage to the computer system without the help from the PC user itself. Speaking of this particular hijacker, it is more than easy to stop its way to your computer. It spreads as an attachment to other free programs, so all you have to do is to know how to install your desired programs WITHOUT this attachment. All that you have to do is to set Advanced or Custom settings for the installation of your preferred program, and then look through a list of optional programs and deselect them. Keep in mind that by choosing Default or Standard installation mode you automatically give your permission to install all additional programs without even getting to know what kind of programs they are. Search.searchfdf.com removal can seem quite challenging especially if this is your first time removing such type of a computer program. Programs like Search.searchfdf.com virus usually do not have uninstallers; therefore, you have to find and remove all of its components manually. You can use instructions provided below, or uninstall it using an automatic anti-spyware software. Choose whichever removal option looks better to you and share your experience with our community in the comments section below. Here, look for Search.searchfdf.com or any other recently installed suspicious programs. Wait until you see Applications folder and look for Search.searchfdf.com or any other suspicious programs on it. Now right click on every of such entries and select Move to Trash. When in the new window, check Delete personal settings and select Reset again to complete Search.searchfdf.com removal. Once these steps are finished, Search.searchfdf.com should be removed from your Microsoft Edge browser. Here, select Search.searchfdf.com and other questionable plugins. Click Remove to delete these entries. Now you will see Reset Firefox to its default state message with Reset Firefox button. Click this button for several times and complete Search.searchfdf.com removal. Here, select Search.searchfdf.com and other malicious plugins and select trash icon to delete these entries. Click Reset to confirm this action and complete Search.searchfdf.com removal. Here, select Extensions and look for Search.searchfdf.com or other suspicious entries. Click on the Uninstall button to get rid each of them. Here, look at the Homepage field. If it was altered by Search.searchfdf.com, remove unwanted link and enter the one that you want to use for your searches. Remember to include the "http://" before typing in the address of the page. Now you will see a detailed dialog window filled with reset options. All of those options are usually checked, but you can specify which of them you want to reset. Click the Reset button to complete Search.searchfdf.com removal process. This entry was posted on 2016-07-25 at 04:26 and is filed under Stealing programs, Viruses. You can quickly scan the QR code with your mobile device and have Search.searchfdf.com virus manual removal instructions right in your pocket. How did you remove Search.searchfdf.com virus?